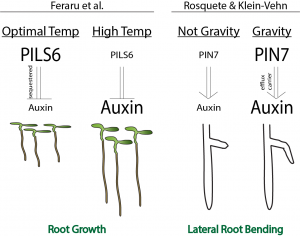 The Many-Faced Auxin Adds to Its Collection – Characterizing two new roles for auxin signaling in the establishment of lateral root growth angles (via PIN7), and in the root growth response to high temperature (via PILS6). In a warming world with increasingly limited natural resources, there has been a renewed focus on how plants grow and adapt to changing environments. In particular, the growth and development of root systems are critical for the plant to find and acquire soil resources (e.g. water and nutrients). Yet, we still understand little about the pathways that regulate root system growth and exploration under different environments. In plants, hormones play a central role in transmitting signals to promote organ growth and development. Yet, the number of different hormones is low compared to the diversity of functional outcomes that they elicit. This leads to a central question in plant biology – how does a single hormone elicit different effects under different situations? The most quintessential plant hormone is auxin. Indeed, an introduction to plant biology often starts with the statement “auxin does everything”. By leveraging Arabidopsis thaliana as a model system, we have made great strides to understand the complexity of auxin signaling and how a single hormone can elicit diverse outcomes through auxilary proteins. These proteins often alter the accessibility of, localization of, or responsiveness to auxin. The two pre-prints highlighted here (both from the Kleine-Vehn research group at the Unviersity of Natural Resources and Life Sciences in Vienna) add additional pieces to the auxin puzzle. In the first pre-print (Rosequete and Kleine-Vehn), the authors explore the question of how Araidopsis lateral root growth transitions from non-gravitropic to gravitropic. The timing of this transition is important to define the effective root angle and impacts the extent of soil exploration. Knowing that the PIN auxin eflux carriers are important for gravity perception, the authors show that the de-repression and polarization of PIN7 is correlated with the onset of the gravity response. 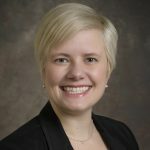 Interestly, the authors show that the timing of this transition varies based on the age of the lateral root – lateral roots closer to the hypocotyl have a longer delay than those closer to the root tip. The second pre-print (Feraru, et al.) investigates the organ growth response of Arabidopsis roots to elevated temperatures. It was previously known that high temperatures (26-29C) result in increased root growth, but the mechanisms by which this growth is mediated have remained a mystery. In this study, the authors investigate the function of member of the PIN-LIKES (PILS) family, PILS6 in high temperature-mediated root responses. PILS are putative auxin carriers that localize to the endoplasmic reticulum (ER), which limit auxin signaling via sequestration. The authors provide evidence for a model in which growth at high temperatures (29C) results in the transcriptional and post-translational repression of PILS6, which leads to an increase in auxin signaling and subsequent increases in root growth. My favorite part of these papers is how they illustrate the elegant complexities of plant hormone signaling. Both root responses are the outcome of elevated auxin signaling, yet these studies demonstrate two different pathways to get there: for one, the de-repression of polarized efflux carriers results in local auxin increases, and in the other, the repression of a protein that sequesters auxin results in local auxin increases. This work presents intriguing new directions and opens up new lines of inquiry. The result from Rosquete and Kleine-Vehn that the plateau phase of “older” lateral roots is longer than “younger” lateral roots begs the question of how lateral roots know how old they are? Is this perhaps another role for auxin and that distance from the auxin maxima at the root tip can help a lateral root know its age? Continuing from Feraru et al., how does PhyB thermoreception impact the root responses to high temperature? Is there any integration between the roots and shoots or are temperatures independently perceived by different organs? Looking forward at the integration of these two studies – how does the plateau phase of lateral roots change in response to high temperatures? Is there any signaling feedback between the PILS6-mediated high temperature regulation of nuclear auxin availability and the PIN7-mediated re-distribution of auxin during the termination of lateral root plateau phases?